The game: Each player represents a prince (in Florence or any other medieval city state) who has the task to bring civil quality ("prestige") to their court. On the one hand they can do this by developing buildings (from universities to chapels) and landscapes (parks, lakes and forests), on the other hand by attracting professionals (builders and jugglers), which foster a pleasant life at the court. Also included is the granting of civil rights. Furthermore the player can increase the prestige of their court directly or indirectly by the acquisition of prestige and bonus cards. Finally, the largest increase in prestige is achieved by the artists and scholars of the court, which, in the pleasant surroundings and equipped with rights, are inspired by the company of people and the entertainment of jugglers to create works of art and science. In the first game phase the decisions of the players are made in competition to each other (by auctions), in the second phase absolutely autonomously in fixed order. 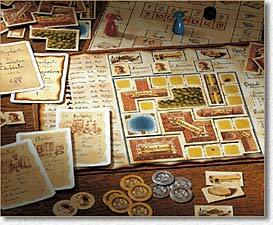 After seven rounds the game is over and the player who has gained the most points of prestige wins. The game has a busy, eager, but nevertheless peaceful character. Coincidences and strokes of fate are avoided. The consequences of the auctions are moderate, since eventually everyone has a successful bid, and each acquired object can be made to fit a plan. The effect of the cards is manageable: all have approximately the same quality of usefulness and one may chose the most suitable card from the top five of a deck. Similar games: Schoko & Co.
Westpark Gamers' opinion: A very balanced strategy game, without chaotic elements, with a nice game idea and a functional design. Whatever the others choose to do, it is always possible, "to have a plan". Whether one decides to count on eagerly established buildings, the development of ones landscape, or the inspiration of artists or the effect of cards, from all of these decisions winning strategies can be derived, and it is not yet clear to us which one is the best. (Our artist Moritz confessed that after our first game in his dreams the following night he felt under pressure to complete more works of art!). We missed some player interactions during the second game phase where all players act autonomously. Everyone struggles by himself and calculates whether is is worthwhile to outperform another players in terms of the number of works of art or if it is better to wait for the next round. 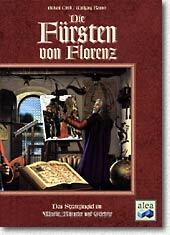 Funagain page with player comments on " The Princes of Florenz "
Luding link to " The Princes of Florenz "